Digital camera technology moves fast as manufacturers attempt to fill every niche in an incredibly competitive market. Just over two years ago we saw Panasonic and Olympus announce the Micro Four Thirds camera standard, and already we are onto the second and third generations of these dinky little cameras. The Four Thirds name comes from the old way of classifying video camera tubes, where the diameter of the tube was expressed in fractions of an inch, hence 4/3". The actual sensor size in millimetres is 17.3x13mm, which is substantially larger than sensors found in compact cameras, which should improve dynamic range and low light performance. As the Micro Four Thirds standard is mirrorless, it allows for a smaller lens mount and lenses, as well as for more compact camera designs making the system appealing to those who wish for SLR quality, without the bulk associated with an SLR camera. By removing the reflex mirror found in SLR cameras, but keeping the same reasonably large image sensor this standard promises to allow for ever smaller camera designs, without compromising on image quality, or the flexibility of interchangeable lenses. Other manufacturers such as Sony and Samsung have been quick to jump on the bandwagon and release their own mirrorless camera systems too, meaning that Panasonic dare not rest on its laurels. Around a year ago we saw the Lumix GF1 release, which garnered plenty of interest due to its compact dimensions and range of SLR-like features. The Lumix GF1 has proved popular with enthusiast-level photographers after a pocket sized camera and snap-shooters seeking a better quality smaller sized camera, due to it's comprehensive range of manual and automatic controls, interchangeable lenses and ability to record images in a RAW file format. 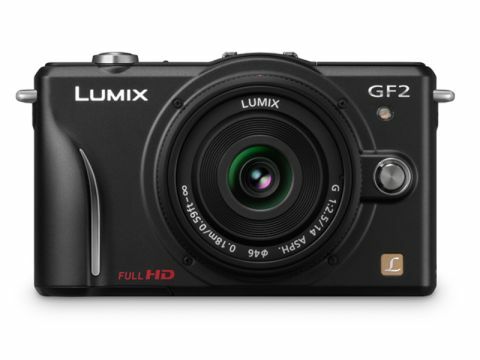 With this latest Lumix, the Lumix GF2, Panasonic has attempted to build on its predecessor, whilst making the camera even more desirable to those after a quality compact camera. The Panasonic GF2 is 19% smaller and 7% lighter than its predecessor and in a nod to the latest consumer technology, a touch screen interface has replaced many of the dials and buttons your average SLR user will be accustomed to. Video is another of the features which seems to create plenty of excitement for many. The Panasonic GF2 includes 1080p resolution high definition video recording, making it a better featured option for motion capture than the recently released Panasonic G2.